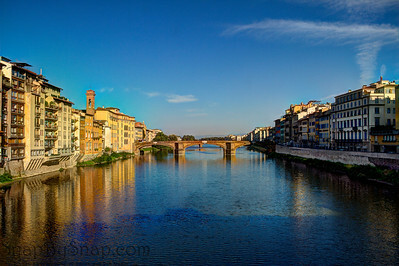 Florence, Italy - Symmetry is very difficult to get. Double the difficulty when you essentially have to get into a yoga pose to look through your view finder. It was worth the effort. 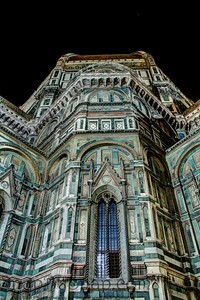 Florence, Italy - The bell tower of the Basilica of Santa Maria Novella. The Floridians spare no expense on the bell tower. It is as impressive as the cathedral itself. 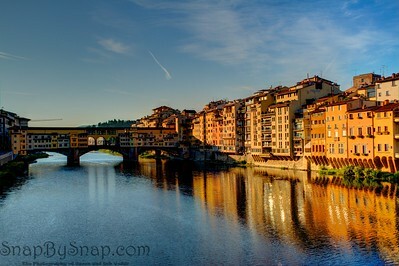 Florence, Italy - The golden bridge of Florence over the River Arno in the morning. 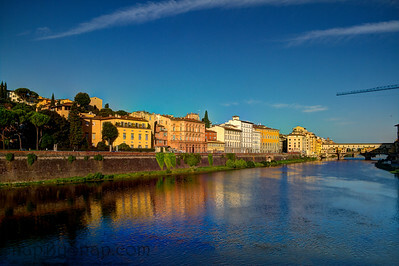 I was not sure what to expect in Florence so I asked a few locals while I was in Naples. I was told to see the Golden Bridge in either the morning or the evening. Yep, they were right. It was worth getting up early and photographing with no breakfast. 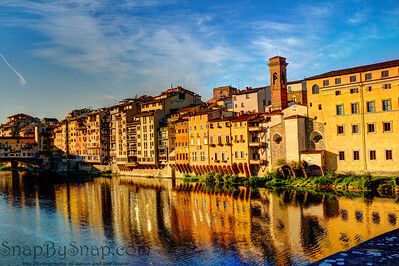 Florence, Italy - The buildings along the River Arno reach for extra floor space. Every one of the are extended over the river. 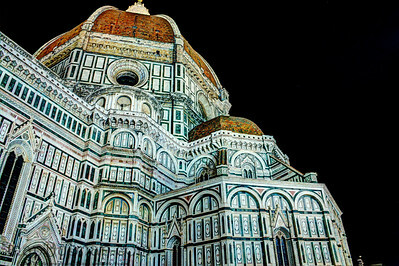 Florence, Italy - What I did not know while looking up at the dome is that tomorrow I will climb all 463 steps to get to the top of the dome. Just mind boggling that we cannot create a building that last 100 years, yet ancient technology can. 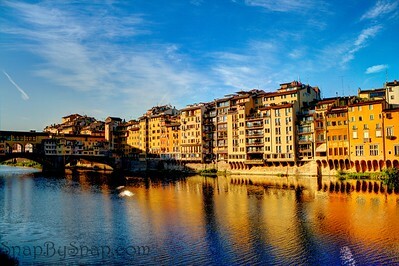 Florence, Italy - Awesome view on the buildings along the river. The only place to see anything like this in America is at Disney World. 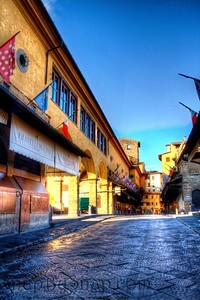 Florence, Italy - I love the little patio that is just getting lite by the sun. By far, the most interesting part of this bridge. 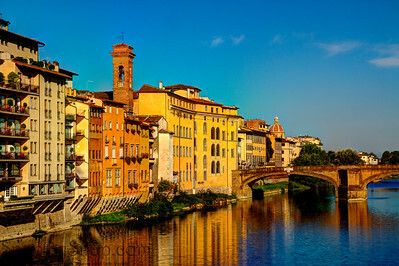 Florence, Italy - I was hoping this was a little restaurant that I could hang out at. No luck. 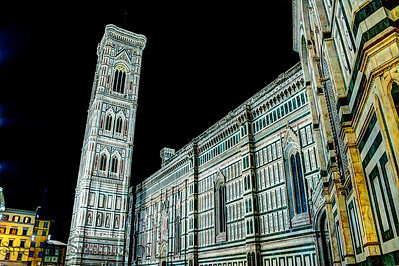 I was to busy exploring Florence. This hodgepodge of buildings is completely unplanned. The end result was art in itself. 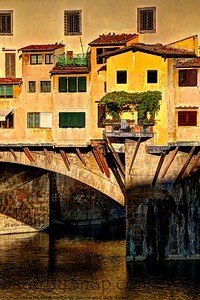 Florence, Italy - No matter how I look at the little ivy covered patio, it just continues to interest me. What is it? What is inside? Do they serve a good Caf�? So many questions and so little time. 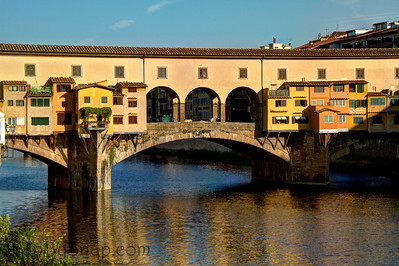 Florence, Italy - A little bit of neat history about the Golden Bridge of Florence is that the upper level was built so the nobles did not have to mix with the commoners when they needed to cross the river. From one side to the other, they are completely isolate from the other 99%. 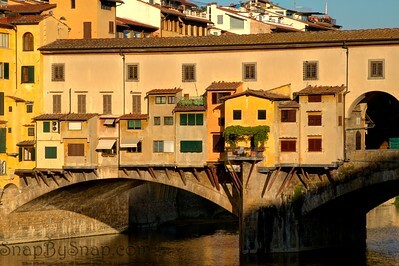 Florence, Italy - Here is the focus of my curiosity on the Golden Bridge. Someone could make a lot of money serving breakfast to tourists on the patio. Only big enough for two, this little spot on the river has so much potential. 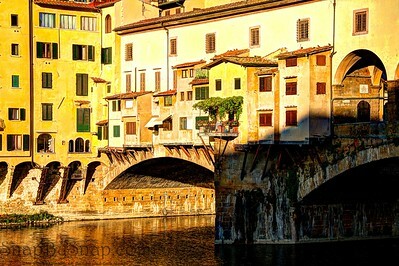 Florence, Italy - Another image of the Golden Bridge of Florence. Great morning light. I wish that I would have had some breakfast. Good thing my wife packed some snakes for me. 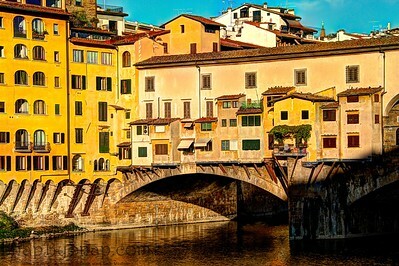 Florence, Italy - the Tuscany colors and architecture is mimicked very often in the US, but rarely do we ever get it right. With a full day of exploring ahead of me, I'm already missing this place and what I will not be able to discover in my limited time here. 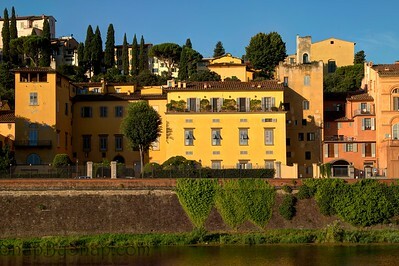 Florence, Italy - I was about 2 miles into what would eventually turn into a 16 hour hike when I took this picture. No breakfast and finishing morning sun. Good think my wife packed the snacks for me. 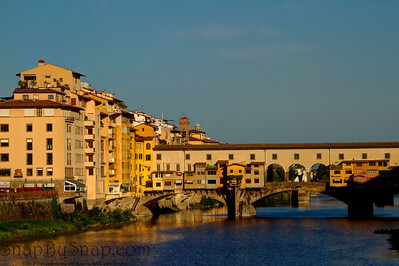 Florence, Italy - Yes, more pictures of the Golden Bridge of Florence. I wanted to take advantage of the quickly vanishing morning light. At least I was getting my exercise in. 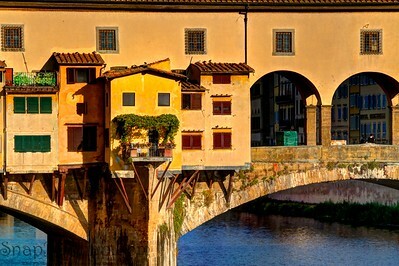 Florence, Italy - Another image of the Golden Bridge of Florence. Great morning light. I wish that I would have had some breakfast. Good thing my wife packed some snacks for me. 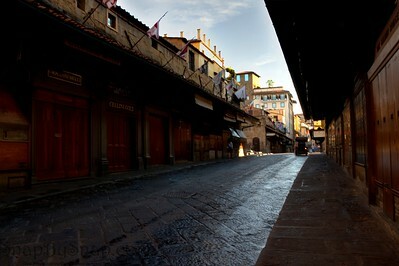 Florence, Italy - Normally this is a festive place. 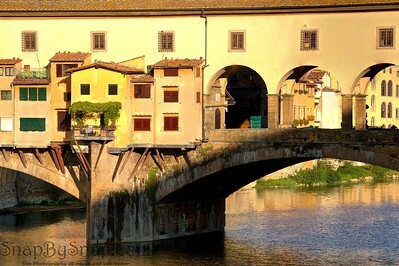 This is the Golden Bridge of Florence, but in the early morning hours. Not a whole lot going on. 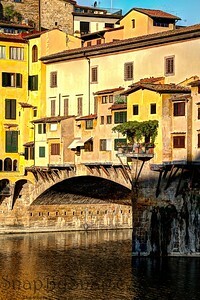 Florence, Italy - Again, this neat little patio on the bridge, Hard to believe that no one is eating breakfast on it. 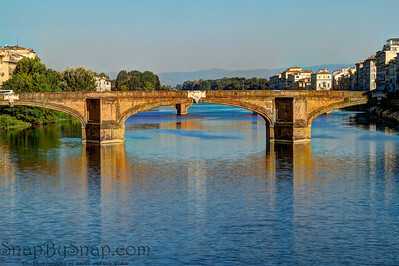 Florence, Italy - This is one of the other bridges in Florence. Not as popular as the Golden bridge, but it fits in with the rest of the city's architecture very nicely. 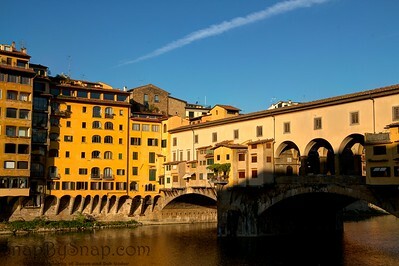 Florence, Italy - In the middle of the Golden Bridge is open. 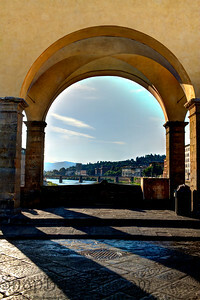 Above these arches is the private walkway used by the cities nobles to transverse the river unnoticed. 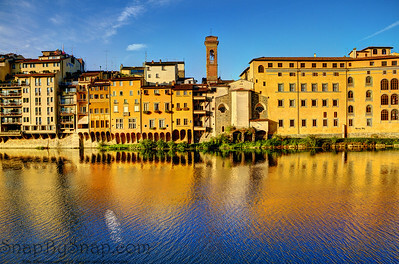 Florence, Italy - the Tuscany colors and architecture is in full display along the banks of the River Arno. 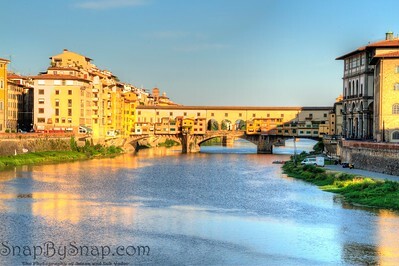 Florence, Italy - In the middle of the Golden Bridge here in Florence, there is a sign saying that it is illegal to leave any locks on this fence. 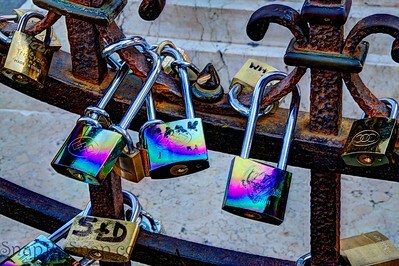 The fence has hundreds of these locks all dedicated to love. 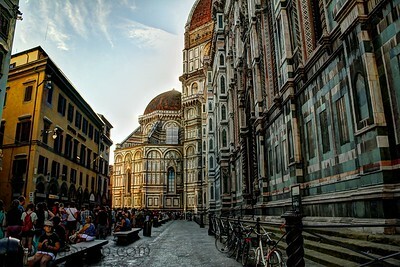 Florence, Italy - This is the line to climb to 463 steps to the top of the Basilica of Santa Maria Novella. I took this right when I got in line. It was about an hour and a half wait. 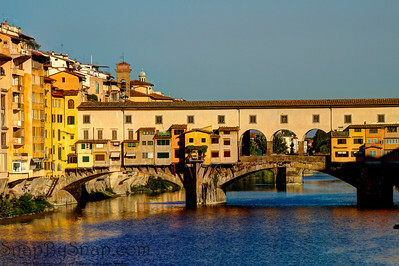 Florence, Italy - Here is a morning few on the Golden Bridge. The stores are closed. This place will be more active in about an hour or two. After the stores close in the early evening, it becomes more of a festive atmosphere.